5 The Square was built between 1996 and 2000 and at this time was a cutting edge example of an ‘aspirational’ mix-mode designed office building. Fast forward to 2015, and the end of its first leasing cycle, and the building had not performed; falling well below the requirements of a modern office building. The age of the building did not justify a rebuild and therefore a design solution was sought which would refurbish the building into a first-class headquarters in terms of its aesthetics, functionality and operational efficiency. 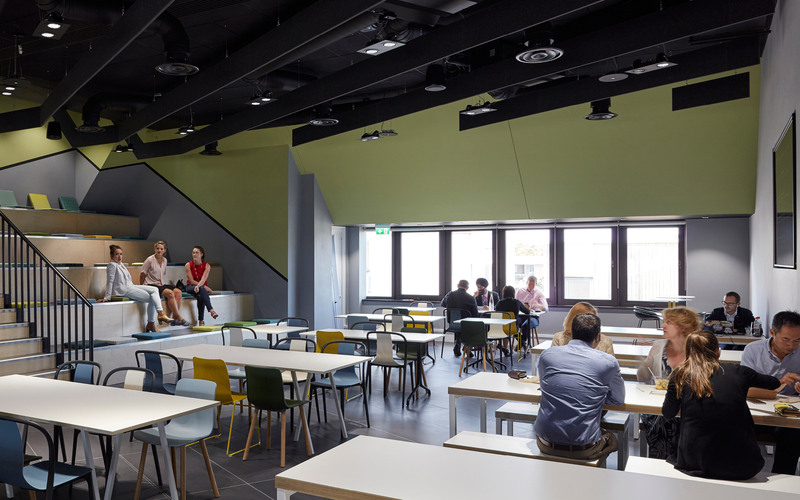 We have modernised the building and added new facilities with significant focus on a design with zero impact on the NIA; helping protect its income earning potential whilst delivering new amenities which meet modern occupier requirements. New facilities include WCs, showers and lockers rooms whilst lifts and the main and satellite cores have been refurbished. The internal layout has been reconfigured and now allows for a higher level of flexibility due to the attention to detail of the design, services and technical specification. The floor plates have been fitted out to CAT A standard and retain their light, spacious nature and the panoramic views of the park. The revitalisation of the building’s 4-storey atrium creates a new grand sense of arrival. This interstitial space between the internal and external entrance doors has been redesigned, providing a defined path into a newly expanded and re-organised reception area. High quality finishes, feature lighting and bespoke furniture have transformed the reception into a contemporary and sleek, yet calm and inviting environment for visitors and occupiers alike. The buildings existing façade spandrel panels have been replaced with new custom designed, dual-layered, lightweight metal panels. This, along with new double-height signage-totems at the entrance and new planting within the interstitial spaces, revitalise the external appearance of the building and help give it a stronger presence within the park.